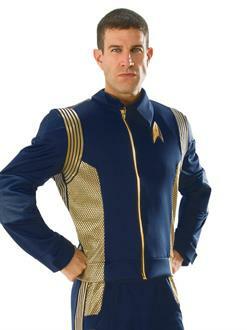 Be in command this Halloween. Put on the Star Trek Discovery Men's Gold Command Uniform and become just like Captain Lorca (played by Jason Isaacs). The long-sleeved blue shirt is lined and features a gold Starfleet emblem on the chest, gold shoulder braids and additional gold accents.